Around Town: Improving Home Improv | Kris Johnson's Blog…sort of. The International House of Johnson is heated by a 21-year-old gas furnace, which has been professionally serviced only once in the past seven years. Recently, the cranky old beast began making a considerable amount of noise when the burner ignited. ((One might describe the sound as a small explosion, the impact of which had increased substantially over the weekend.)) The choice between me emulating Ralphie’s father from A Christmas Story or simply calling someone to clean and service the thing wasn’t really a choice at all; though I might be able to give Ralphie’s dad a run for his money in the rassafrassin’ department, I’m no handyman. While the guy ((You know: the guy. Anyone who comes into your house to perform some service you yourself are either unwilling or incapable of performing yourself.)) was at the IHoJ, I received a call from Laura: in addition to a new thermocouple ((I love that my furnace has parts in it that sound like they’re right out of a sci-fi movie.)) (which the guy happened to have), we needed a new furnace filter (which he didn’t), so I was to stop at Lowe’s on the way home from work to pick up some filters. 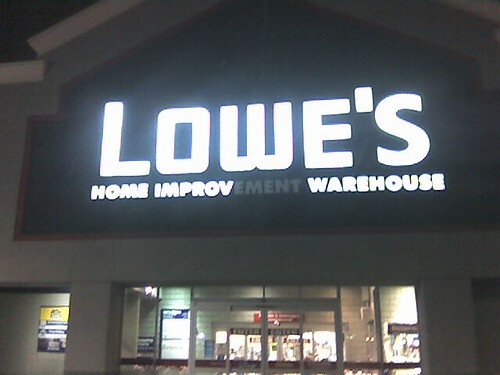 Arriving at Lowe’s, I was somewhat surprised to discover that the company (as evidenced in the photo above) had abandoned the DIY home repair market in favor of the DIY improvisational comedy market (which, I can only imagine, is incredibly niche). Fortunately for me, they weren’t finished converting the store, so while Aisle 7 was entirely devoted to audience participation shortform improv, ((“Give me a vocation, a movie title, and an odd habit,” the blue-vested fellow shouted as I walked by.)) Aisle 8 still contained heating supplies, including fiberglass furnace filters. The furnace is much quieter now, but for some reason I find myself suppressing a slight chuckle every time I hear the blower kick in.